First of All, Download “Crypto” Premium Theme. If you do not download yet (click here) to log in your account and download “Crypto” Premium Theme. 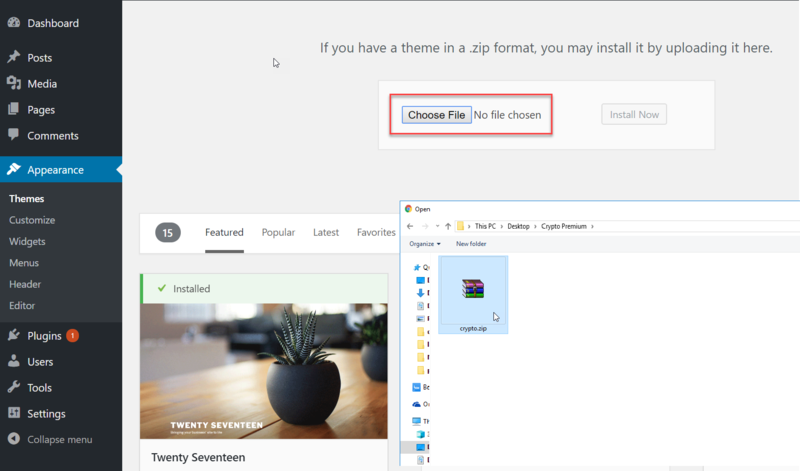 Next Choose for the Crypto zipped theme file you downloaded from A WP Life and Install. 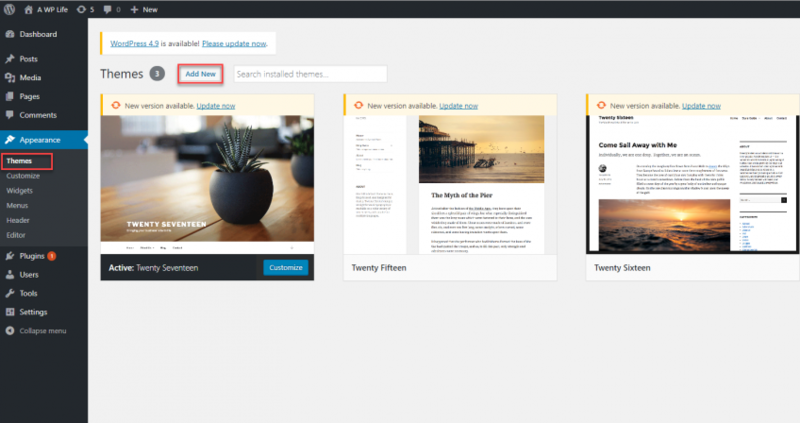 Go To WordPress site Appearance > Themes and activate Crypto Theme. 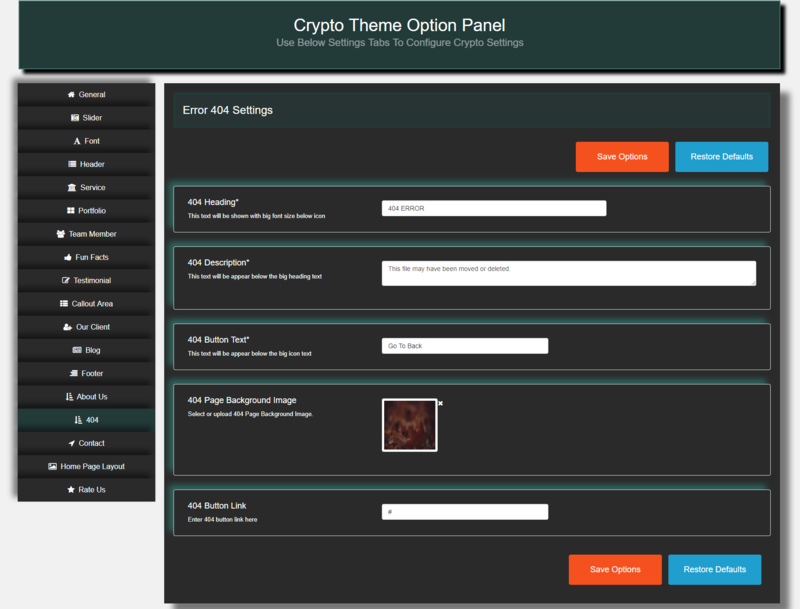 You can define your own General Settings from within the Crypto Theme Options page in your WordPress Dashboard. To locate the Crypto Theme Options, click the Appearance> Theme Options link in your WordPress Dashboard, Then click on General Menu Tab. 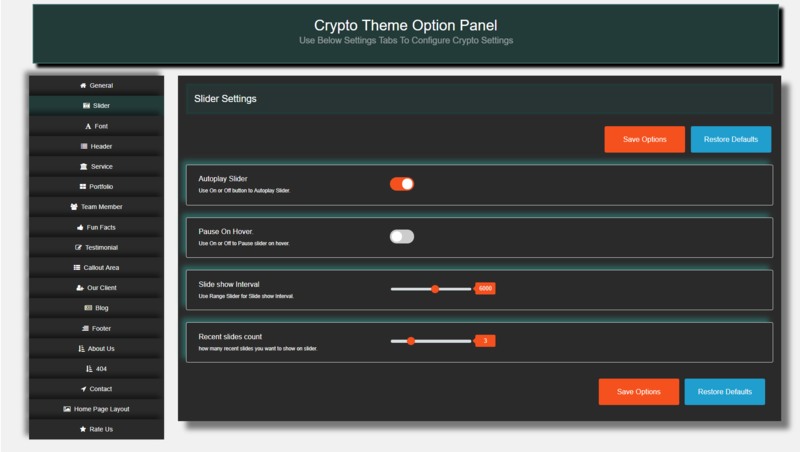 You can define your own Slider Settings from within the Crypto Theme Options page in your WordPress Dashboard. To locate the Crypto Theme Options, click the Appearance> Theme Options link in your WordPress Dashboard, Then click on Slider Menu Tab. 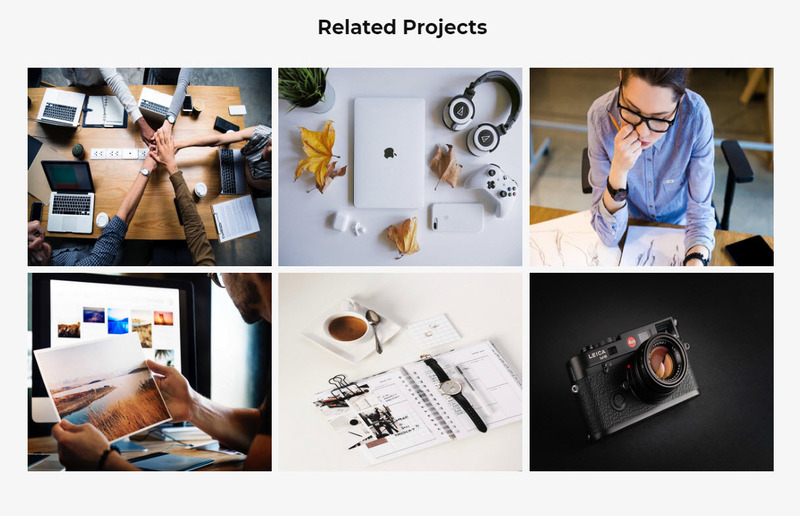 How to add a new slide in slider section? 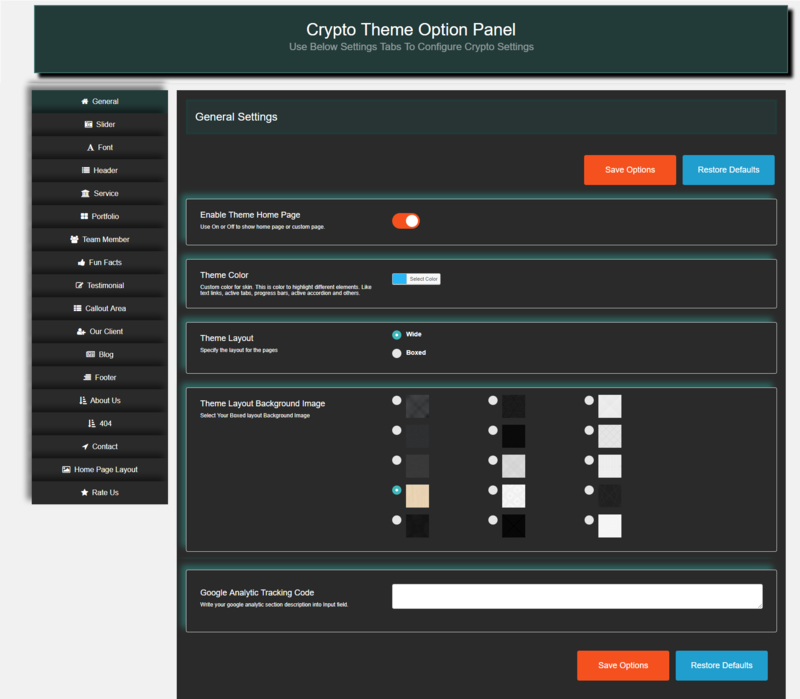 You can define your own Typography Settings from within the Crypto Theme Options page in your WordPress Dashboard. To locate the CryptoTheme Options, click the Appearance> Theme Options link in your WordPress Dashboard, Then click on Typography Menu Tab. 1. Font Family Setting, Use Input field and insert font family name into it for apply Fonts Family. 2. Letter Spacing Setting, Use range bar to Set letterSpacing Between Fonts. 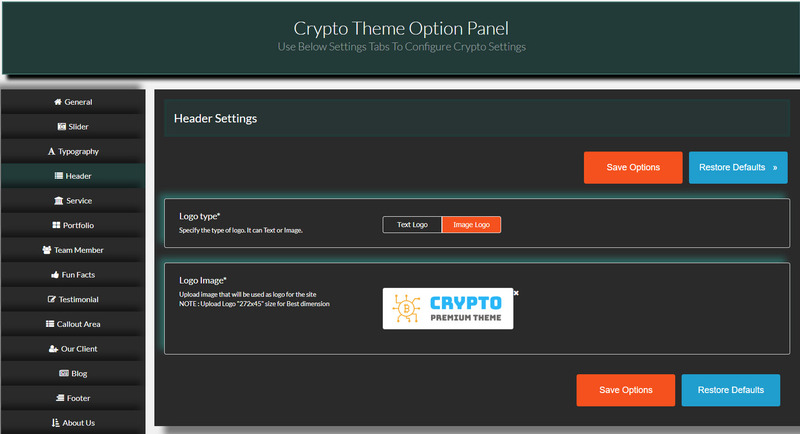 You can define your own Header Settings from within the Crypto Theme Options page in your WordPress Dashboard. To locate the Crypto Theme Options, click the Appearance> Theme Options link in your WordPress Dashboard, Then click on Header Menu Tab. 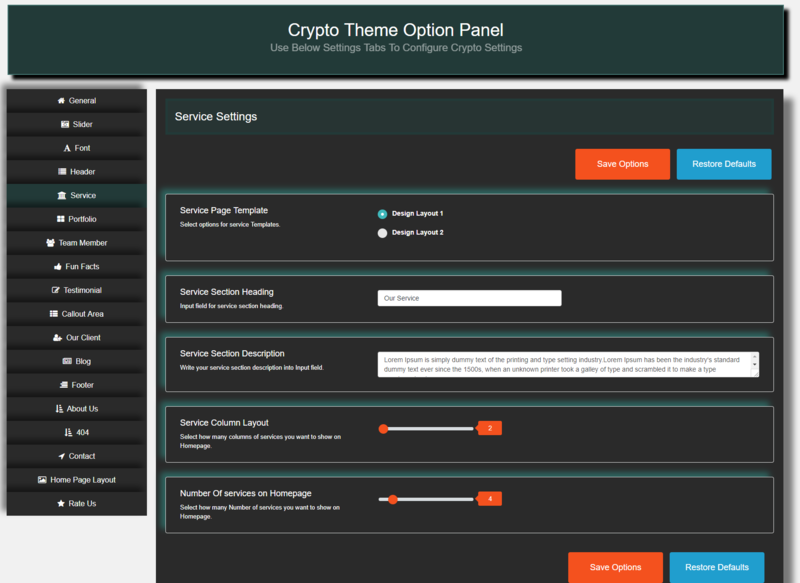 You can define your own Service Settings from within the Crypto Theme Options page in your WordPress Dashboard. To locate the Crypto Theme Options, click the Appearance> Theme Options link in your WordPress Dashboard, Then click on Service Menu Tab. 1. 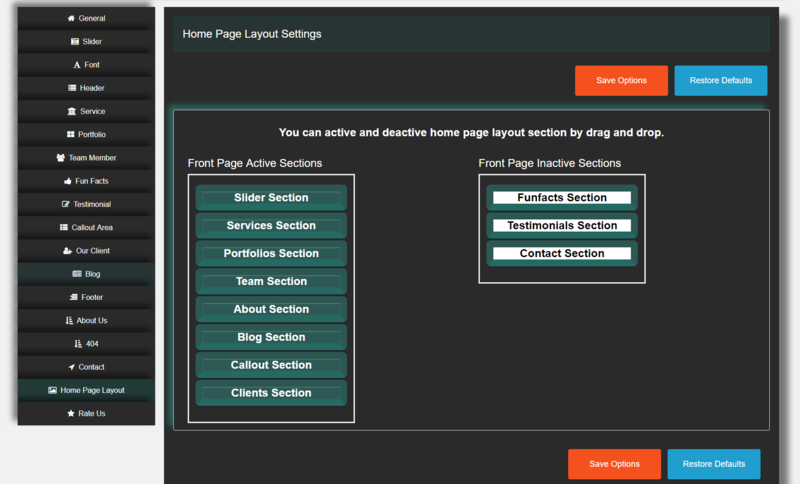 Service Page Template Setting, Select Different Design for service Templates to show your services. 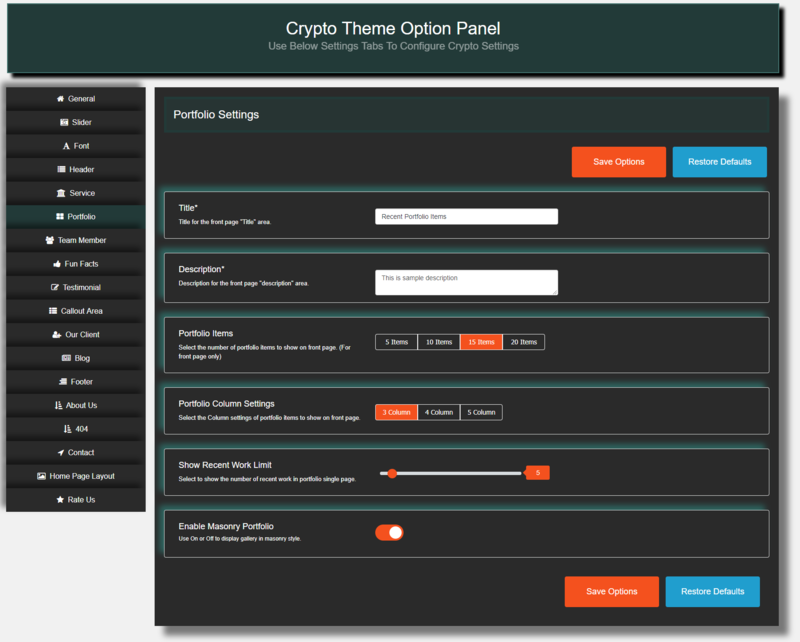 You can define your own Portfolio Settings from within the Crypto Theme Options page in your WordPress Dashboard. 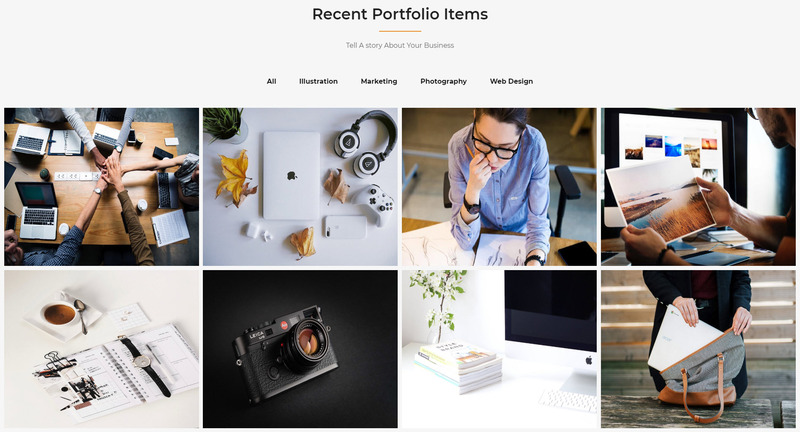 To locate the Crypto Theme Options, click the Appearance> Theme Options link in your WordPress Dashboard, Then click on Portfolio Menu Tab. 2. 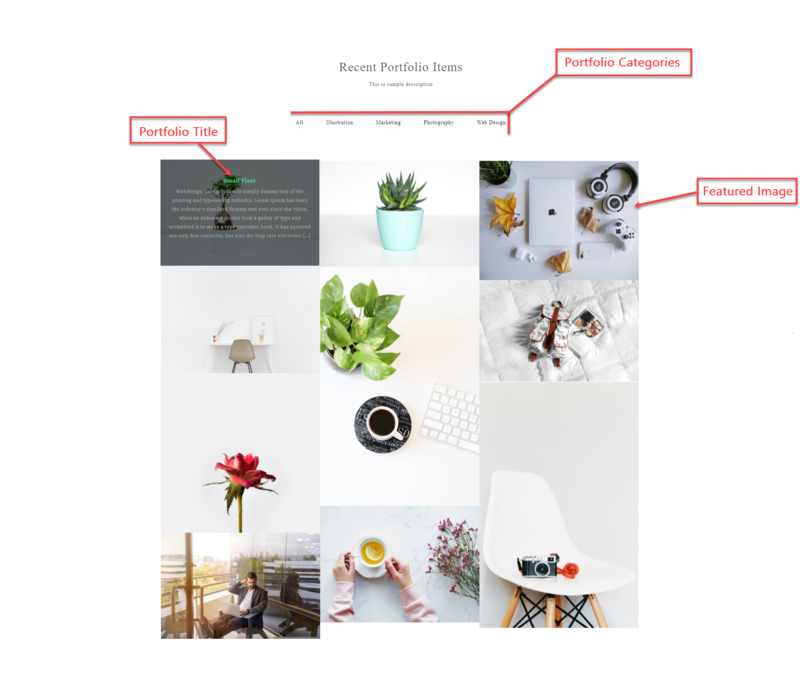 Portfolio Description Setting, Description of the front page “Description” area. (For front page only). 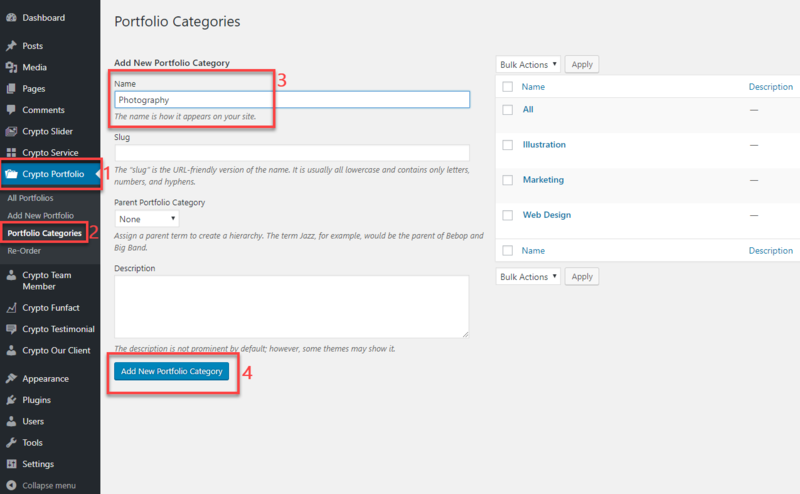 4.Portfolio column settings,Select the Column settings of portfolio items to show on front page. 5. 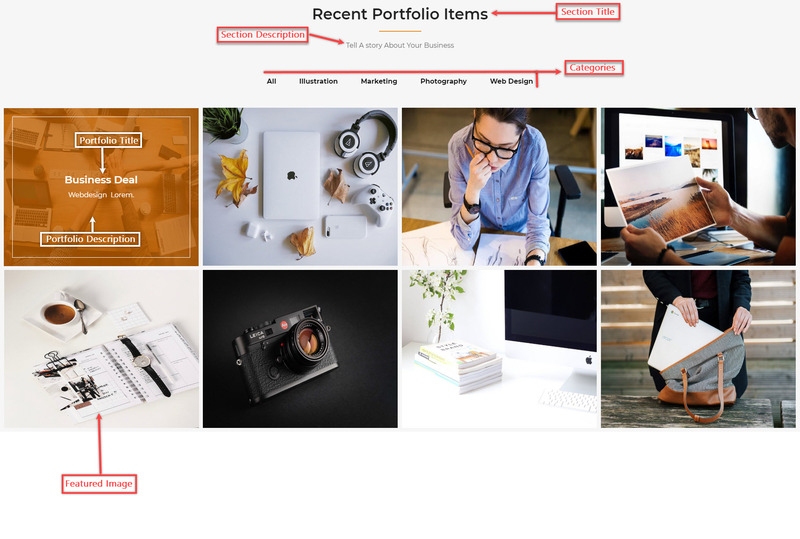 Show Recent Work Limit Setting, Use range Slider to show the number of recent work in portfolio Single pages. 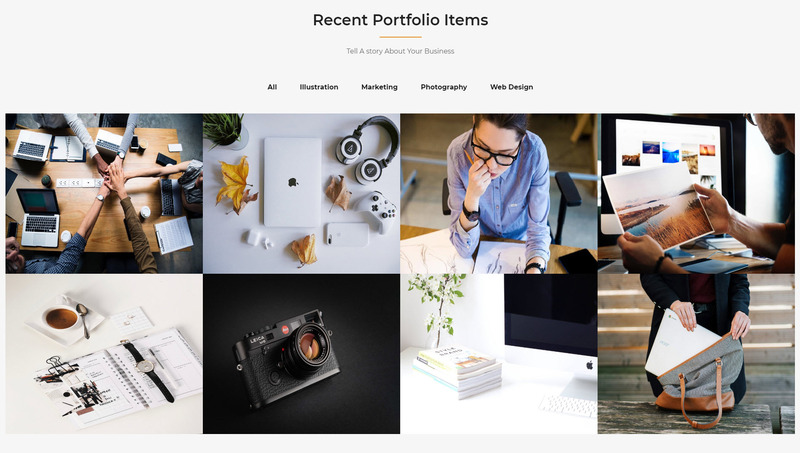 Recent 5 Items Are shown In Portfolio Single page. 6. 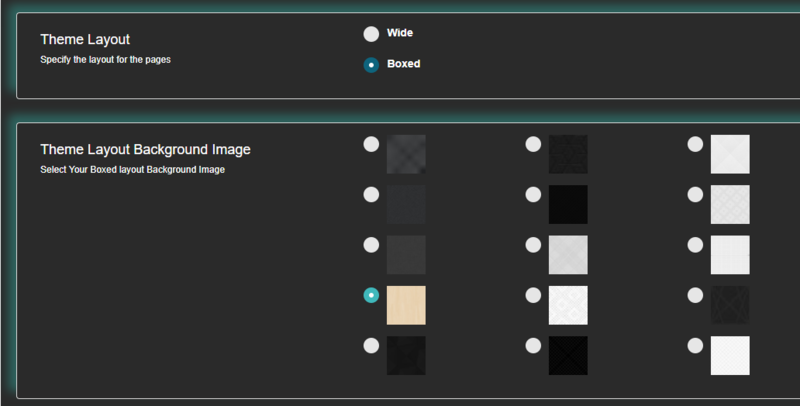 Enable Masonry Portfolio,Use On or Off to display gallery in masonry style. 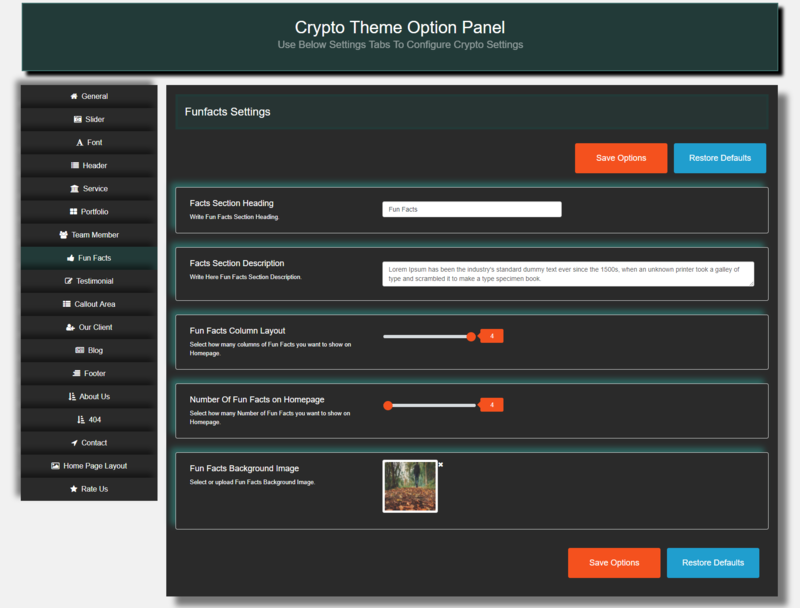 You can define your own Fun Facts Settings from within the Crypto Theme Options page in your WordPress Dashboard. To locate the Crypto Theme Options, click the Appearance> Theme Options link in your WordPress Dashboard, Then click on Fun Facts Menu Tab. You can define your own Testimonials Settings from within the Crypto Theme Options page in your WordPress Dashboard. 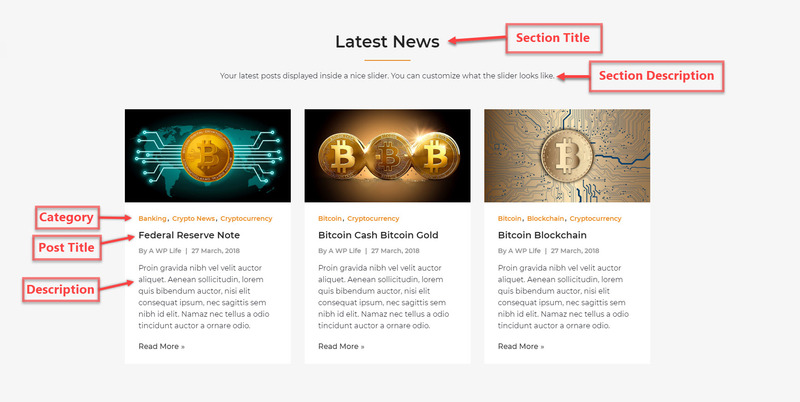 To locate the Crypto Theme Options, click the Appearance> Theme Options link in your WordPress Dashboard, Then click on Testimonials Menu Tab. 4. Transitions Slide SpeedSetting, Use range slider to Set slide changing duration into milliseconds ( Default is 1000). 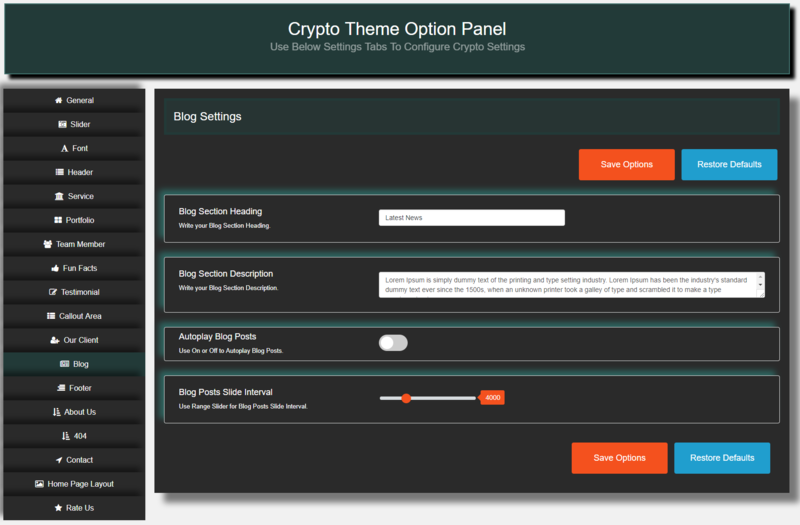 You can define your own Blog Settings from within the Crypto Theme Options page in your WordPress Dashboard. To locate the Crypto Theme Options, click the Appearance> Theme Options link in your WordPress Dashboard, Then click on Blog Menu Tab. 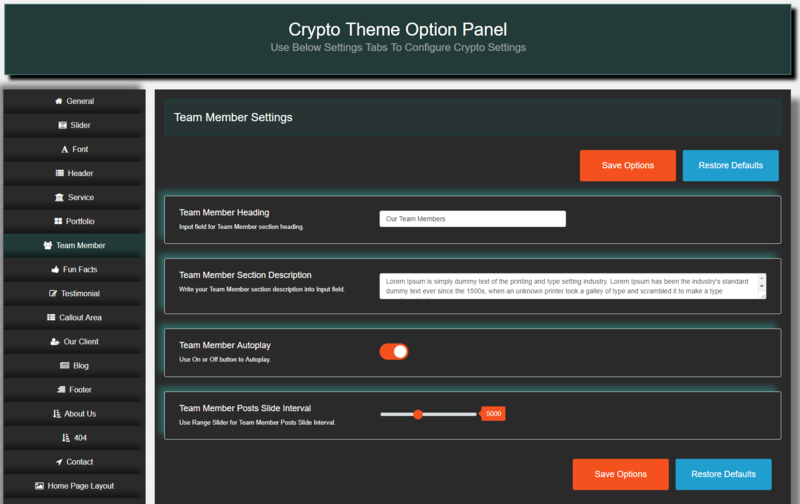 You can define your own Team Member Settings from within the Crypto Theme Options page in your WordPress Dashboard. To locate the Crypto Theme Options, click the Appearance> Theme Options link in your WordPress Dashboard, Then click on Team Member Menu Tab. 1. Team Member Heading Setting, Write Your Team Member section heading. 2. Team Member Section Description Setting, Write your Team Member section description into Input field. You can define your own Our Client Settings from within the Crypto Theme Options page in your WordPress Dashboard. To locate the Crypto Theme Options, click the Appearance> Theme Options link in your WordPress Dashboard, Then click on Our Client Menu Tab. You can define your own Our Footer Settings from within the Crypto Theme Options page in your WordPress Dashboard. To locate the Crypto Theme Options, click the Appearance> Theme Options link in your WordPress Dashboard, Then click on Our Client Menu Tab. 6. Footer Bottom Icon Setting. 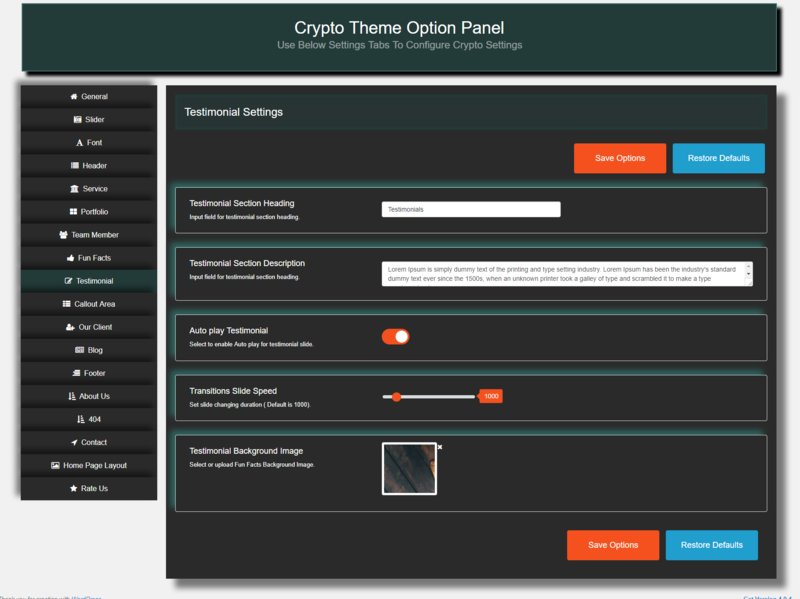 You can define your own About Us Settings from within the Crypto Theme Options page in your WordPress Dashboard. To locate the Crypto Theme Options, click the Appearance> Theme Options link in your WordPress Dashboard, Then click on About Us Menu Tab. 4. Show / Hide Service Section Setting, Use Radio Buttons to Show or Hide “Service” section into About Us page. You can define your own 404 Error Settings from within the Crypto Theme Options page in your WordPress Dashboard. To locate the Crypto Theme Options, click the Appearance> Theme Options link in your WordPress Dashboard, Then click on 404 Error Menu Tab. 4. 404 Background Image Setting, Use or upload 404 Page Background Image. You can define your own Contact Settings from within the Crypto Theme Options page in your WordPress Dashboard. To locate the Crypto Theme Options, click the Appearance> Theme Options link in your WordPress Dashboard, Then click on Contact Menu Tab. 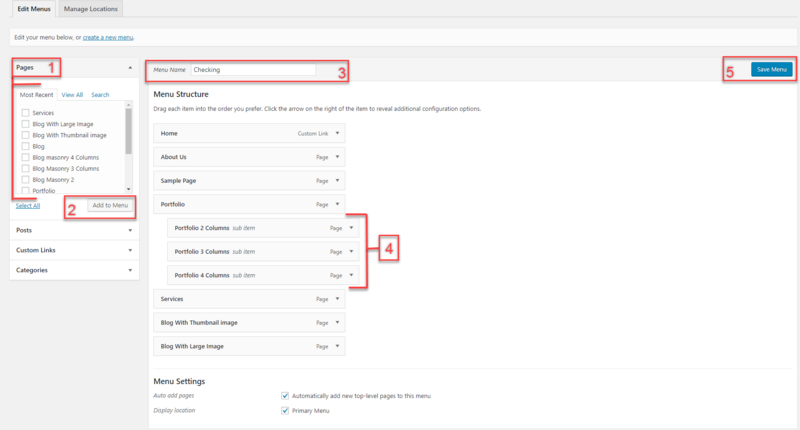 You can define your own Call-out Area Settings from within the Crypto Theme Options page in your WordPress Dashboard. 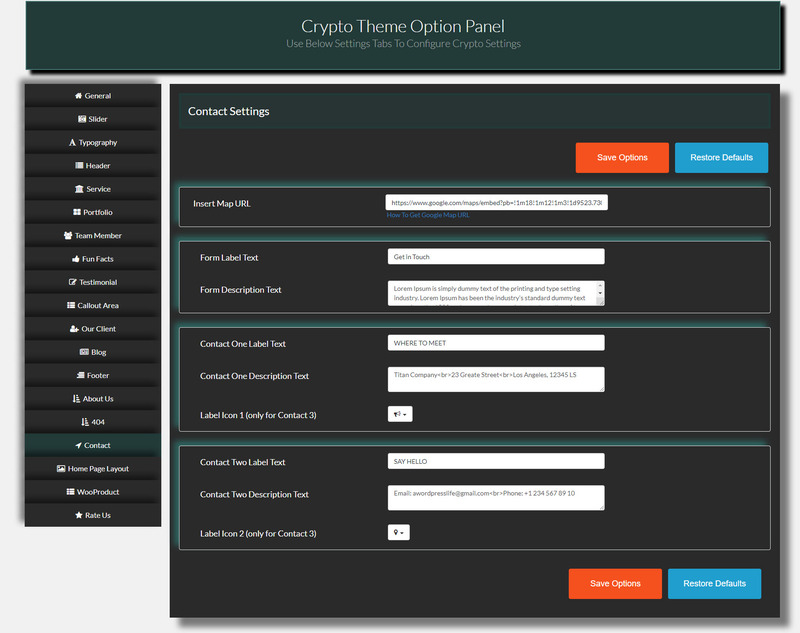 To locate the Crypto Theme Options, click the Appearance> Theme Options link in your WordPress Dashboard, Then click on Call-out Area Menu Tab. 1. Callout Title Setting, Use Input Feild to Write your callout area title text. 2. 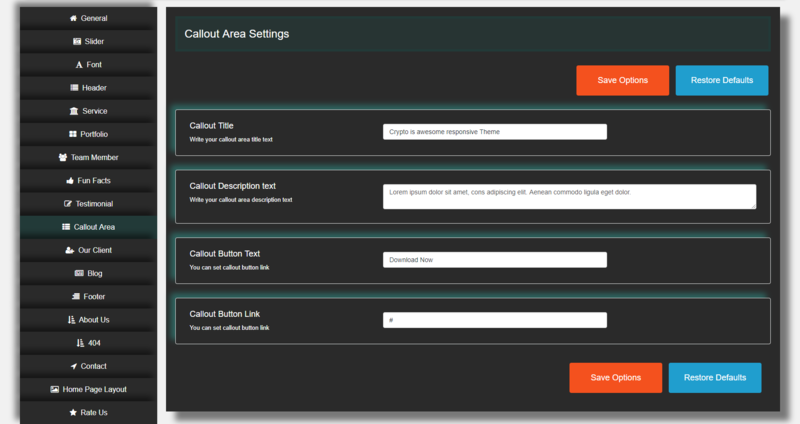 Callout Description text Setting, Use Input Feild to Write your callout area description text. 3. Callout Button Text Setting, Use Input Feild to Write Callout Button Text. 4. Callout Button Link Setting, Use Input Feild to set the callout button link. 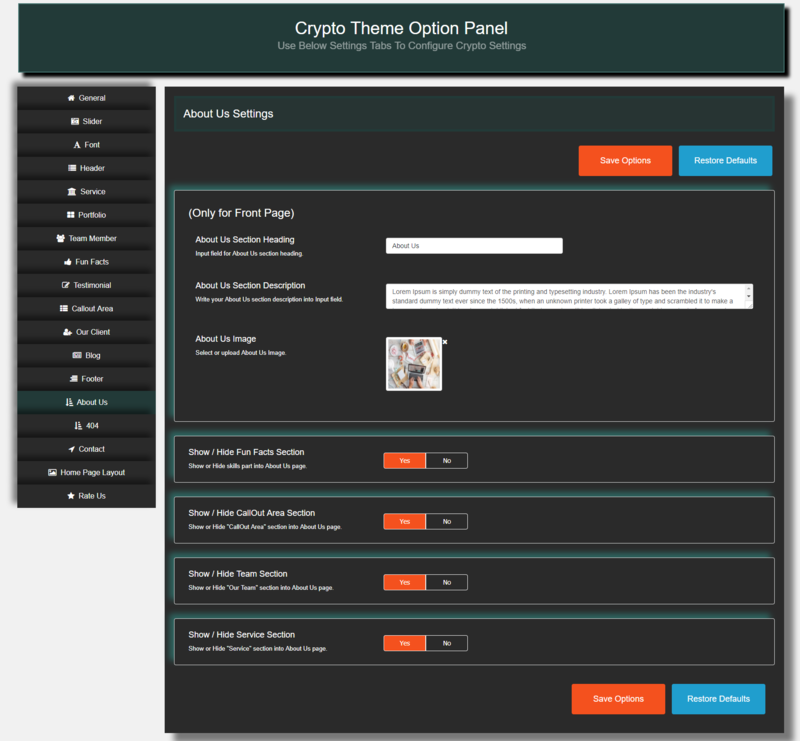 You can define your own Homepage Layout Settings from within the Crypto Theme Options page in your WordPress Dashboard. 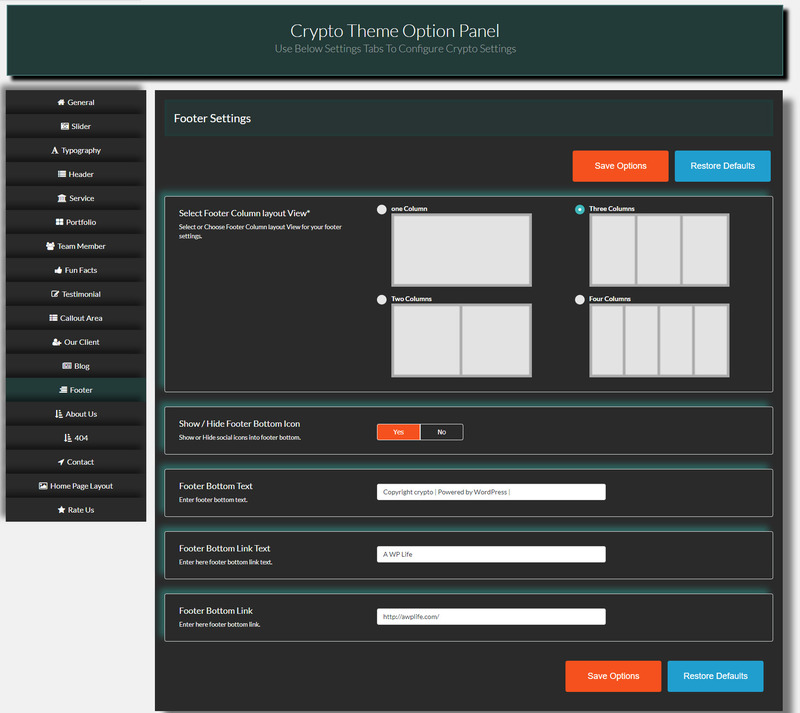 To locate the Crypto Theme Options, click the Appearance> Theme Options link in your WordPress Dashboard, Then click on Homepage Layout Menu Tab. Step 1 → Click On “Crypto Portfolio” Custom Post Type, there is you found Some options.